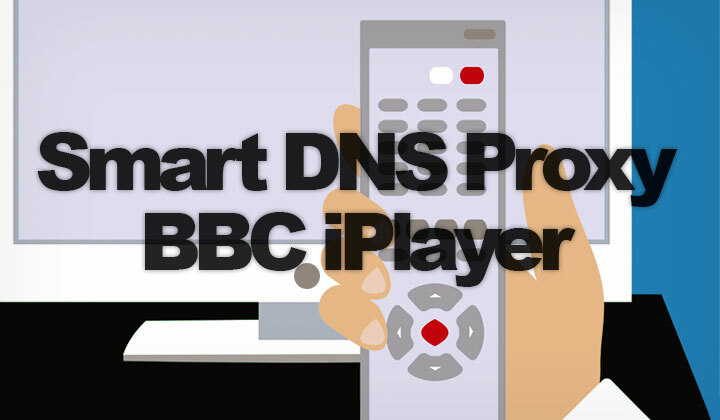 Read this quick guide on BBC iPlayer support with Smart DNS Proxy, as well as find out the essentials on how it works and what are the alternatives. Just want to try it out iPlayer? Get a free trial of Smart DNS Proxy without credit card here! iPlayer is the most popular online video streaming site in the UK. Offering BBC television programming to only those who are physically located in the country. Nearly 10th of the UK population is living abroad, with more than 5 million British people living in countries like Australia, Spain, United States & Canada. Which means that there are huge numbers of people trying to circumvent this location restriction, and that BBC puts in a huge effort to block this circumvention. As a consequence, not all Smart DNS services, or VPNs work with iPlayer. However, Smart DNS Proxy does. And it’s one of the most stable Smart DNS providers with good support for unblocking BBC iPlayer location restrictions. 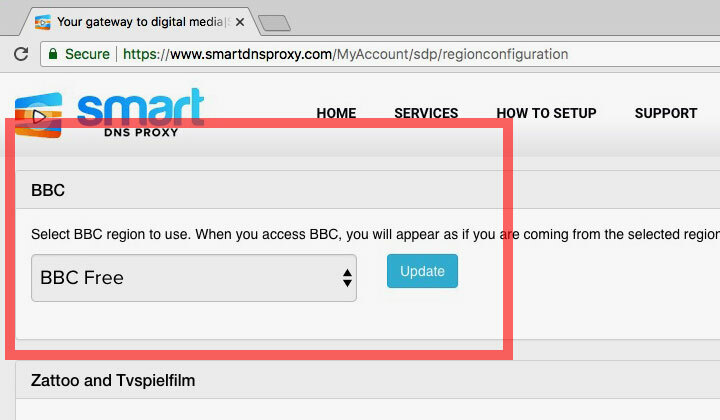 After you have signed up, Smart DNS Proxy is automatically set up to work with iPlayer from any country location in the world. In the My Account dashboard, region settings can be changed from where it says “Update”. 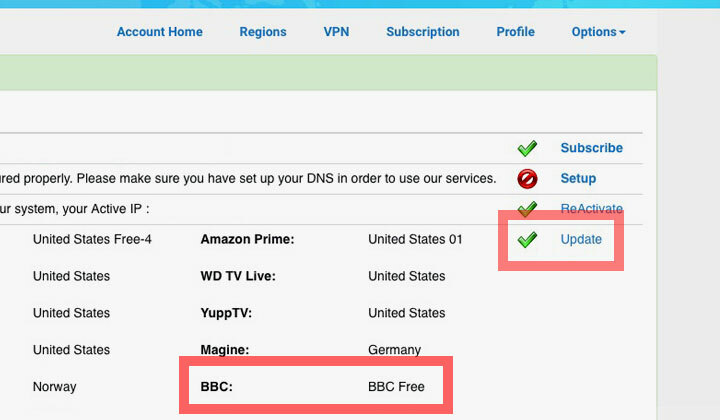 There is only one “BBC Free” setting. Which says “Select BBC region to use. When you access BBC, you will appear as if you are coming from the selected region.”. You can proceed directly to the set up instructions of the device that you are using. 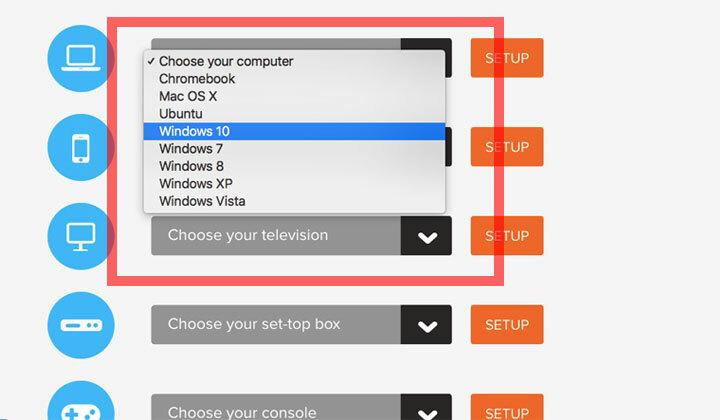 Support includes Chromebook, macOS, Ubuntu, Windows 7,8, 10, Android, iPad, iPhone, Smart TVs, set-top boxes, game consoles, you name it! Out of all the Smart DNS providers that I know, Smart DNS Proxy easily provides the most extensive device support. However, setting up DNS is often a manual process that unlike VPN, has a learning curve. For this, Smart DNS Proxy has excellent, live support to tackle any possible problems you may have. Essential for using Smart DNS for circumvention. Despite the benefits of using a VPN connection, like an easy connection client, a secure connection and ability to circumvent many other website locations restrictions throughout the world. Most VPNs are not suitable for unblocking BBC iPlayer. Smart DNS Proxy does provide a VPN. But while their Smart DNS is working great, there’s just no way you can get a good VPN at such a low price. And when you are streaming video, you don’t want to be slowed down. Smart DNS usually provides faster streaming than VPN does. So you really do need to sign up with a good VPN provider to get a stable, fast connection. On top of that, most VPNs are constantly blocked by the folks at BBC. For watching BBC iPlayer with a VPN, I recommend ExpressVPN. Many locations in the UK for increase reliability (multiple servers in Berkshire, Docklands, East London, Kent, London & Maidenhead). Dedicated, official BBC iPlayer support by monitoring blocked IPs and changing them to fresh ones as needed. I recommend using VPN instead of Smart DNS Proxy if you are located within the EU or United States. So you can get a very fast connection to a UK based VPN server. Unfortunately, at the moment I don’t know of any other VPNs that I could safely recommend. This value is just hard to beat. OverPlay’s Smart DNS has second best BBC iPlayer support. It’s a Smart DNS provider that’s as good as Smart DNS Proxy. They currently support BBC iPlayer & BBC Sport. Streaming supports all web browsers, and iOS, Android, PS4, PS3, Xbox One, Xbox 360 as well as Roku. Also, their included VPN is much better than Smart DNS Proxy. Personally I like SmartyDNS because they have an easier connection client than any other provider, just like VPN. So you can turn the DNS on and off easily. But unfortunately, I have frequently seen problems with their BBC iPlayer support, as their servers have been blocked for long periods of time. When such problems arise, they work on fixing the issue but it simply takes too long. Any problems, or iPlayer is not working for you? Comments and questions for BBC streaming are welcome! This post is most suitable for British expats who are living overseas in countries such as, Australia, Spain, United States, Canda, Ireland, New Zealand, South Africa, France, Germany, Portugal, Cyprus, UAE, Pakistan, Singapore, Switzerland, Israel, Netherlands, Thailand, China (Hong Kong), Turkey, India, Kenya, Belgium, Barbados, Saudi Arabia, Italy, Jamaica, Japan, Sweden, Greece, Nigeria, Norway and Egypt. A kind notice from the author.. that some of these pages on my blog are affiliated with the third-party providers they represent. Thanks for voluntary support!